Ryan Young Launched his debut CD called 'Ryan Young' in 2017. It is available direct from Ryan by clicking on 'Buy Ryan's CD' below. The debut album from award-winning fiddler Ryan Young, who was voted; Up and Coming Artist of the Year; at MG Alba Scots Trad Music Awards in December 2016, brings inventive twists to old and forgotten Scottish tunes. Produced and engineered by triple Grammy winner Jesse Lewis. 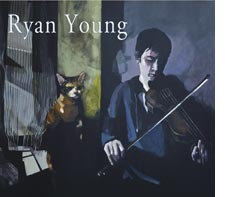 This album places Ryan among a list of world-class musicians who have worked with Jesse, including The Silk Road Ensemble, Yo-Yo Ma, Bela Fleck, Jan Vogler and Brooklyn Rider. Ryan is accompanied by James Ross on piano and Leo Forde on guitar. Listen to some extracts from all the tracks. 'Hailed as “Up and Coming Artist of the Year” at last December’s Scots Trad Music Awards, fiddler Ryan Young has built up a glowing reputation. This eponymously-titled debut, produced by the Grammy-winning Jesse Lewis, can only underpin his standing. You should receive email confirmation of your purchase. Many thanks for your interest in Ryan's music. One or two people seem to have issues with the Paypal checkout so should you have any issue with your order please contact Ryan. Sign up and receive occasional news from Ryan.